Worship Matters: Who do you listen to? I'm reading a book called "The Principle of the Path" and want to take some time to write about one of the concepts in this book. The point of this post is so simple, at the end of it you very well might say "no duh." That's how it hit me...until I looked at how I actually apply this principle. It's one thing to know something, or even to believe something; but it's quite another to implement it and live by it. So what is the big it? Before we get there, let me ask you this. If you were driving and got lost, who would you rather get directions from? Someone who is on the side of the road and is also lost, or someone who has been to the place you're going and can tell you how to get there? Or let's say you're on vacation in Waikiki and you've never been there before. You're trying find the surf-rental shop. 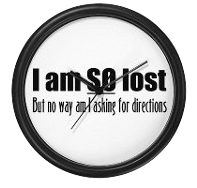 Do you ask directions from someone who is also on vacation for the first time, or from the local who has lived his whole life there? The answers to both of those questions are obvious...we want directions from the 2nd person...the one who has been where we're trying to go and can tell us exactly how to get there. Now let me ask you a question; the last time you needed some really good advice about something, who did you ask? One of your friends? Your peers? A brother or sister? Or, did you ask advice from someone who has been where you're trying to go? A classic example of this can be found in 1 Kings 12. Rehoboam has just taken over the kingdom from his father, Solomon, who has just passed away. He is approached by the people's representative, Jeroboam, who has but one request of the new king; lighten our load, and we will serve you forever. Rehoboam wisely asks for 3 days to consult with two groups of people. Group 1 are the elders; these are older, wise men who have been with his father Solomon, (the wisest man who ever lived), and their advice is to do just what the people have asked...lighten the load, and their hearts will be with you. Group 2 is Rehoboam's peers...in fact, not even his peers, but his groupies - men his age or younger perhaps, who serve him. They tell the new king to make their load even heavier. Rehoboam goes with the advice of the younger ones, and it doesn't go well at all. The people reject him as king, appointed Jeroboam as their king and the kingdom gets split in half. There are two glaring mistakes we can see in this story, that we would do well to avoid. 1) When seeking advice, make sure you ask the right people. Ask it from those who are where you want to be. 2) If you're not willing to follow the advice you get, don't bother asking. Rehoboam, from all appearances, already knew what he wanted to do and merely was looking for affirmation from his buddies to do it. Once he got that affirmation, he moved. What path are you on? Is it taking you where you want to go? Are you getting good advice from those who are where you want to be?